So it’s the Tuesday before social sewing, my fabric.com order hasn’t shipped, and I don’t know if I’ll have enough time to make my frocktails dress without social sewing. What’s a girl to do? Buy more fabric of course! On the Thursday I invested in 3 metres of the beautiful drapey polyester (crazy hot in summer I’m sure, but sooo slinky). On Friday my fabric.com order showed up. Of course. Fate had a beautiful hand in that I actually prefer my last minute back up fabric! 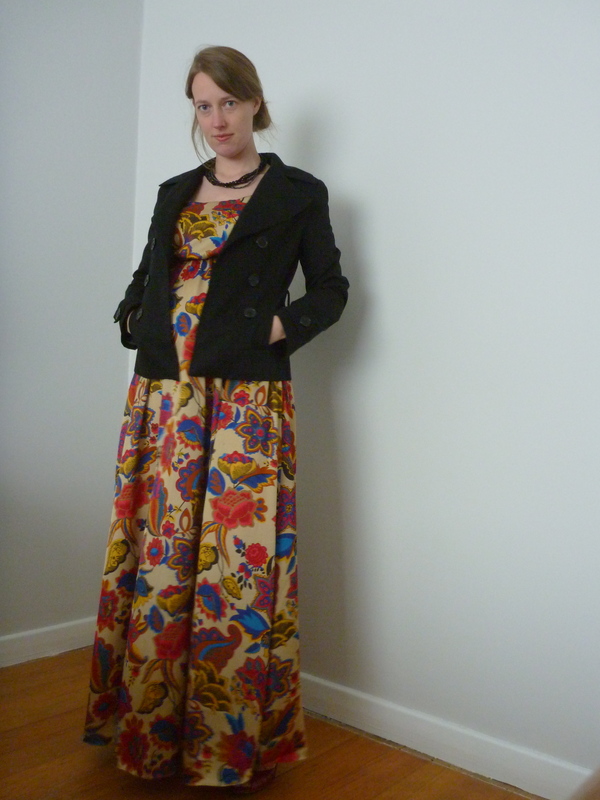 I wore this to the amazing Frocktails event hosted by Kat at Longrain in Melbourne, and it was such an fun night. Melbournians are renowned for tending to dress in black, so it was hilarious to see most the restaurant in muted colours, and then three tables of fantastic prints and bold colours and striking designs! You rock ladies! I was very slack and forgot to take photos, and was a little tired and shy for the night. In the morning I woke up and was full of regret, there were so many questions and conversations not had! Anyway, if you want to see some photos, Melanie (poppykettle) took heaps and other bloggers have lots popping up around the place. Due to the epic tired, I didn’t get any dress photos on the night (it got hemmed at 5.25, when I had to leave by 6pm! ), so I’ve recreated the outfit I wore (less makeup and hair). Also due to the epic tired, the washing is still a little out of control, so this dress came out for playgroup on Wednesday as well with a cardigan and flip flow. I think it works perfectly well for both, but feel free to disagree with me on this point. -The skirt front was also cut with a longer hem at the centre front, reducing as it got closer to the side seams. 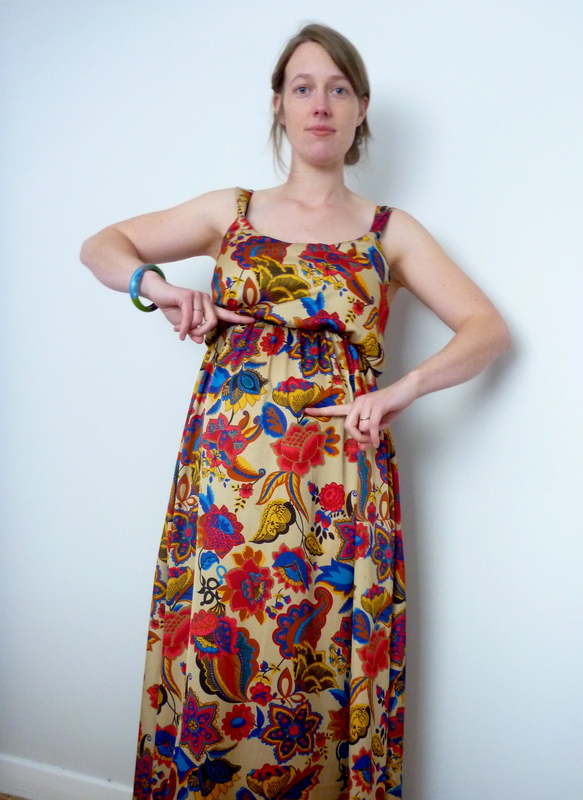 The waistline was the really crucial adjustment for this to work as a maternity dress, and to illustrate the point, please note the altered waistline, and where my waistline once upon a time existed. This is going to be a TNT maternity pattern for the hot Australian summer, especially (spoiler for people who haven’t procreated yet) when I can’t reach my legs to shave them! This looks great! I love this dress! Your maternity alterations are really clever. And you know what? You looked GORGEOUS in it! Love the fabric, love the alterations, love everything about it! thanks 🙂 hopefully it will fit for awhile yet! Yeah, it’s under those things I never thought about before being pregnant. I assumed it was all walking around, “glowing” and rubbing my belly. Soooo far from the truth. The dress looks amazing! I didn’t know you were pregnant again 🙂 I’m happy I’m pregnant now because winter is starting soon, so no need to shave my legs 🙂 How far along are you? 18 weeks now, which is crazy for how much the belly has popped out this time around. What about you? Being pregnant in winter is so much nicer than summer…I planned this poorly! And you looked amazing! I’m all for the dress being worn about in daylight hours with a throw-on. Can’t get over how well this translates to maternity wear – love the fabric! Beautiful! 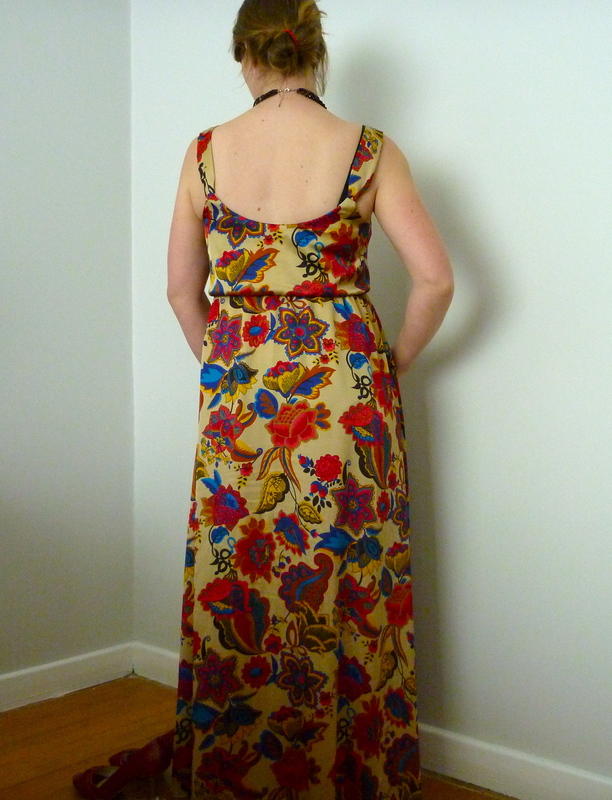 – Amazing fabric and I love the bumpification of the Saltspring. Perfect. So lovely to meet you – and even ‘epic tired’ you looked radiant & gorgeous. Loved the dress. I was thinking we should do a winter escape to Brisbane next year – surely that would appeal to the Melbourne sewing squad. Although Sydney is closer and they do have the Stitch Bar! Stunning dress Sarah. Clever alterations to make it maternity appropriate. 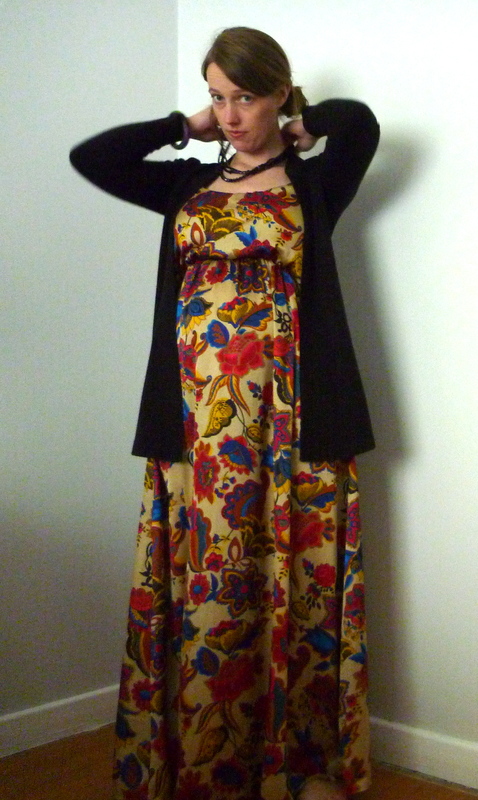 Subsequent baby bumps do like to pop out quickly. 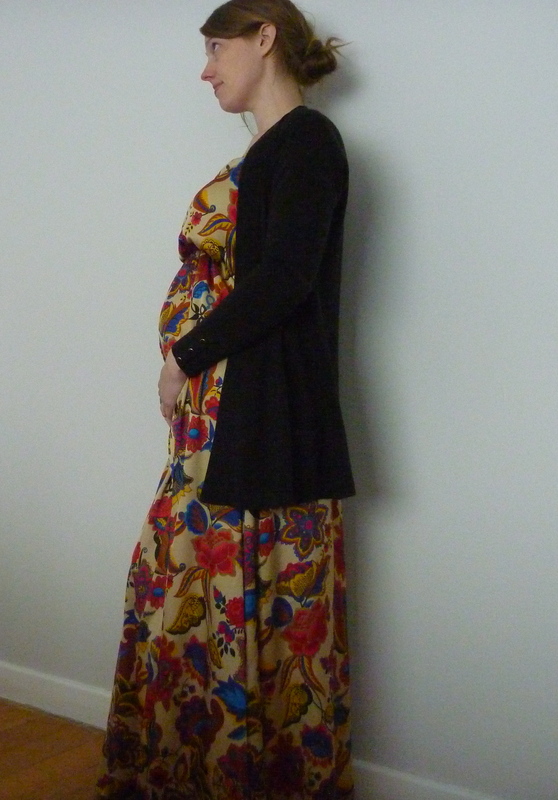 I remember being 6 weeks and wondering how I was going to hide the bump for the remainder of the first trimester! Thanks 🙂 I miss wovens so much at the moment so it’s nice to have something woven! It’s kind of scary how much a difference it is- there’s a girl at work (first baby) that is two weeks behind me, and she barely looks preggo at all! Sarah. You look amazing in this dress. What a gorgeous maternity dress. You look striking. I hope you get a lot of wear from it. Not too much though…. I can’t imagine doing this a third time! Oh you are just the most adorable pregnant lady ever. I loved your dress and have noted it for next time I’m pregnant. I sewed myself nothing first time around. It was so lovely to meet you at frocktails! It was lovely to meet you as well! I didn’t sew much the first time, but this time around I think it’s the only way to go. Maternity clothes are always neutral or black. Not exactly a sewcialists idea of fabric! Winning back-up fabric 🙂 So perfect for this pattern & agree with everyone else that you looked amazing on the night! It was such a fun night 🙂 I loved your Dress so much, everyone looked awesome. Are you coming on sat to social sewing? 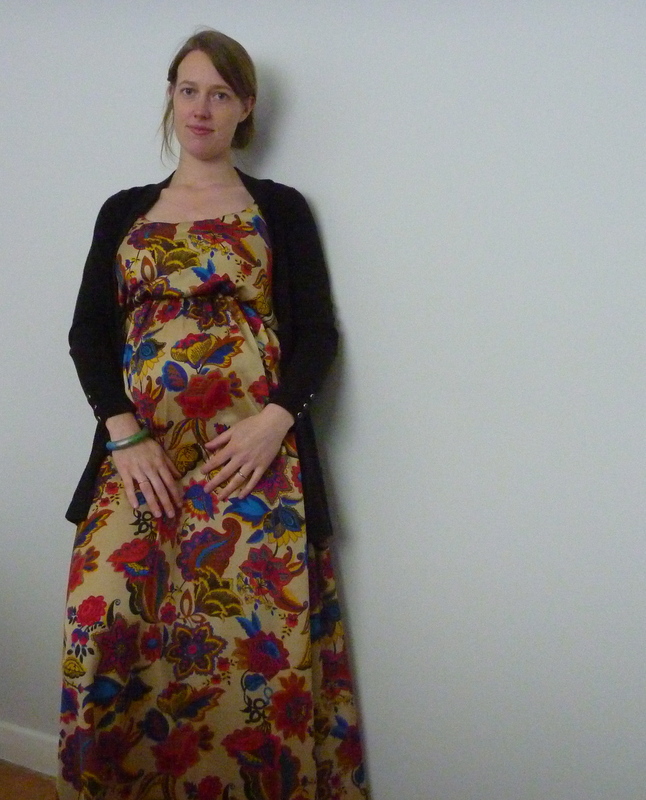 What a great maternity dress for summer. It looks amazing. Thanks, I’ve got many more lined up for sure! You look great (though sympathise with the epic tiredness). It’s so lovely to have a beautiful dress like this when you are pregnant. I’m sure you’ll get lots of wear out of it! Thanks! I’m still tempted to try your shirt conversion with sewaholic. I really miss woven fabric at the moment! Cute dress! I hope the summer isn’t too hot for you, plenty of people have told me how uncomfortable summer was for them when they were pregnant and that is in the New Zealand summer, let alone Aussie! 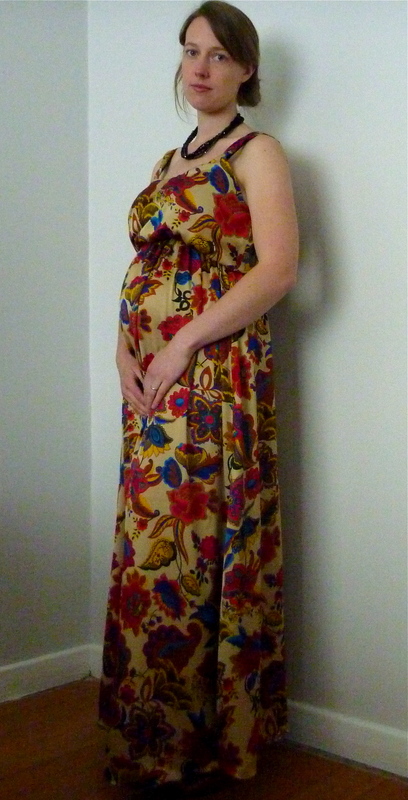 Beautiful dress and beautiful mum-to-be! Congratulations on bub #2. You look lovely.